COLORADO SPRINGS, Colo. — USA Triathlon today announced the start of the second annual National Triathlon Week, an initiative to celebrate multisport and all its constituency groups. National Triathlon Week will take place from today through Sunday, July 22, both on social media and in communities across the country. The complete schedule — including ideas for how to participate from just a few minutes to a full day — is available at usatriathlon.org/triweek. #TriWeek is largely a social media-based initiative, as aspiring triathletes, age-groupers and elites are all encouraged to share their multisport experiences online. Contests will be held each day of the week as participants are asked to share their questions, inspiring stories and advice with the wider multisport community. In addition, triathletes can enter a contest to win a USA Triathlon Lifetime Membership by emailing marketing@usatriathlon.org or posting on social using #TriWeek and #WhatsYourFinishLine with a description of how the sport of triathlon helped them reach their goals. All award winners will be announced on Monday, July 23, and will receive prize packs from USA Triathlon corporate partners. The week culminates with Race Weekend on Saturday and Sunday, in which first-timers and experienced triathletes alike are encouraged to complete a race, register for their next event or simply volunteer to staff an on-course aid station. The fourth weekend of July typically boasts one of the highest participation rates in multisport events across the country, with 177 USA Triathlon-sanctioned races taking place this year, including 62 youth races. Click here to find a race near you this weekend. As part of Race Weekend, USA Triathlon and LA Fitness are putting on the final two events of the Time to Tri Indoor Triathlon Series, presented by ROKA. These 60-minute indoor triathlons will take place at two LA Fitness locations in Arizona (Phoenix and Oro Valley) on July 22. The series is intended to introduce first-timers to the sport of triathlon, part of the industry-wide Time to Tri initiative launched by USA Triathlon and IRONMAN to grow the sport by 100,000 new participants by the end of 2020. Click here to register today — or for athletes who are not local to Arizona, check out usatriathlon.org/tri60 to find an indoor triathlon near you. National Triathlon Week is not only a celebration of triathletes and paratriathletes of all ages, genders and ethnicities, but also a chance to recognize those who play an active role in fueling the multisport lifestyle — from race directors and officials to coaches and race-day volunteers. In addition, this week is a valuable opportunity for individuals new to the sport to glean information and inspiration from current triathletes both in their local communities and across the country. USA Triathlon’s certified coaches, race directors, clubs, Regions and volunteer leadership structure (e.g. Board of Directors, committees and councils), as well as the USA Triathlon Foundation, will all play an active role in celebrating and promoting National Triathlon Week. USA Triathlon partners will also participate on social media throughout the week. Former Major League Baseball player and current MLB Network analyst Eric Byrnes will serve as a National Triathlon Week Ambassador, participating on social media throughout the week and sharing his passion for multisport. In fact, Byrnes will begin a Triathlon Across America on July 22 — the last day of National Triathlon Week — in an effort to inspire youth across the country to be more active. He will swim seven miles from San Francisco to Oakland, California; bike 2,344 miles from Oakland to Chicago; and run 846 miles from Chicago to New York City — all with the mission of providing funding to grassroots organizations that support youth sports participation. For more about Byrnes’ journey, visit ericbyrnes.com/letthemplay. For more information about National Triathlon Week, including a detailed explanation of the seven themed days, frequently asked questions and prize pack giveaway information, visit usatriathlon.org/triweek. 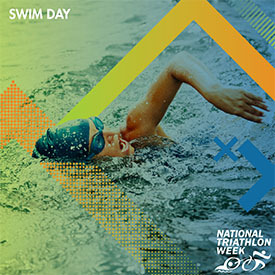 Kick-off National Triathlon Week by celebrating Swim Day today! Share your favorite tip for improving your swim. Share a photo from a favorite swim. Define your own finish line. What are your goals this year? Tag USA Triathlon and tell us about it on your social channels. Catch a Q&A on Facebook with Rocky Harris, USA Triathlon CEO, with a live session scheduled for 3 p.m. MT today. Need to cut some time off your swim? Check out USA Triathlon’s Find a Coach tool, and get started today! Go for a swim and share your experience on social media. Pictures, video and stats are all encouraged! Participate in the Swim Day Contest by commenting under the post on USA Triathlon’s social media channels. Share your favorite way to train for your swim, and be entered to win the daily prize. Not a swimmer? No problem! Celebrate today by checking out the other multisport disciplines.